Dancers in traditional Basque costumes perform outside of the Basque Block. The importance of Boise's Basque heritage is highlighted in the revitalization of the historic properties on The Basque Block, a portion of Grove Street. Boise (population 185,787), the capital of Idaho, was founded in 1863 following the discovery of gold in the Boise Basin. The town grew quickly initially, not only because of the influx of prospectors, but also because of its location along the Oregon Trail. In the early 1900s, Boise again enjoyed rapid growth due to the expansion of agriculture through irrigation. Among those drawn to the area were many Basques from the Western Pyrenees Mountains. 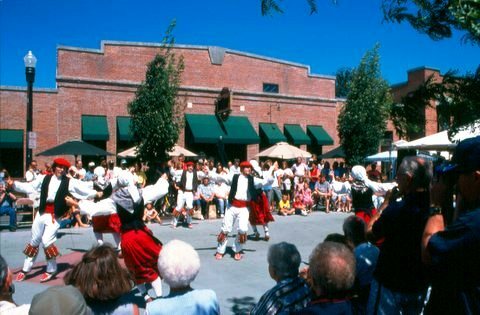 Initially sheepherders, the Basques gradually moved into the mainstream of city life in Boise, bringing their colorful culture with them. Today Boise has the largest concentration of Basques per capita outside the Pyrenees Mountains. Boise's first home, the O'Farrell Cabin (1863), is owned by the city and recently has been restored. The community's early history is also being celebrated through implementation of the Oregon Trail Parkway Plan, which will mark and interpret the trail's location through the city. The importance of the city's Basque heritage is highlighted in the revitalization of the historic properties on The Basque Block, a portion of Grove Street. Revival in the area started with creation of the Basque Museum and Cultural Center. Private reinvestment followed, supported by city-funded streetscape improvements and interpretive signage. The newest project in the area is rehabilitation of the Cyrus Jacobs/Uberuaga House (1864), the oldest surviving brick building in Boise. Thousands of visitors visit The Basque Block each year. While in Boise, they can also visit 14 other museums or interpretive centers and 10 historic districts.